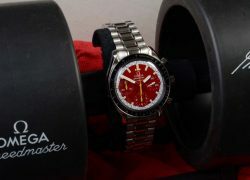 Item description: In 1996, the first version of the Omega Speedmaster ‘Schumacher’ Limited Edition was launched on behalf of Omega by Schumacher at his go-kart track in Kerpen, Germany. The new Speedmaster came with a choice of either a red or yellow dial, in celebration of Schumacher’s first year driving for Ferrari. This example comes with the ‘Schumacher’ red dial, which is generally the preferred colour by collectors. The watch with classic Speedmaster stainless steel case, and with stainless steel matching bracelet. The dial in red enamel, with three sub-registers, along with white and black racing grid pattern. To the outside of the heslite crystal, is the black enamel bezel with tachometer scale. Case-back with relief Omega logo, and serial number. The watch with Omega’s automatic 1141 movement. Additional description: The watch contained within its special limited edition ‘Schumacher’ packaging. The packaging consisting of two Formula 1 style scaled down rubber tires that could be pulled apart, splitting at the middle to reveal the watch. On the right side of the tire was Schumacher’s signature and on the left were Omega brand markings. The two wheels are easily removed via aluminium nuts, which allow the watch to be removed from its display for wear. Included is a small stand allowing the watch to be displayed to the centre of the tyres. Additionally, the watch and scaled rubber tyres are packed within their own red material bag with black draw string (the watch with yellow dial, having a similar bag in yellow material). The bag with watch and tyres fit within a typical Omega branded white cardboard storage box. 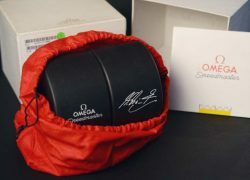 Contained within the storage box are the Omega Speedmaster ‘Schumacher’ booklet, confirming the Speedmaster is his choice of watch to wear when racing. Condition report: Close to mint condition, storage age only. The watch probably worn a few times only. 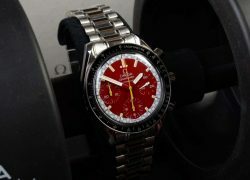 Background to the ‘Schumacher’ Limited Edition Omega Speedmaster: The production of this edition ran from 1996 to 1999, and was limited to 5000 pieces, 2,500 red dials, and 2,500 yellow dials. In 2000, Omega launched another limited edition, entitled the ‘Racing Schumacher’ edition. Background to Omega: La Generale Watch Co, was founded at La Chaux-de-Fonds, Switzerland in 1848 by Louis Brandt. He made a living by assembling key-wound precision pocket watches from parts supplied by local craftsmen.. In 1894, his two sons Louis-Paul and César developed a revolutionary in-house manufacturing and total production control system that allowed component parts to be interchangeable. Watches developed with these techniques were marketed under the Omega brand of La Generale Watch Co. By 1903 the success of the Omega brand led to La Generale Watch Co to spin off the Omega brand as its own company, and the Omega Watch Co was officially founded in 1903. Britain’s Royal Flying Corps purchased Omega watches in 1917 as the contracted timepieces for its combat units, as did the American army in 1918. Since 1932 Omega have been the official timekeepers for the Olympic Games. With the start of W.W.II, Omega once again received contracts from both Britain and America. The Omega so-called ‘Dirty Dozen’ contract watch, being particular desirable amongst collectors. 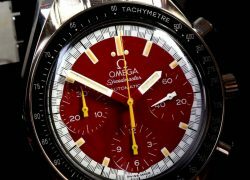 NASA used Omega watches, and it was an Omega Speedmaster which became the first watch worn on the moon by astronaut, Buzz Aldrin. Omega’s have also featured in James Bond since 1995, which led the company to bring out a range of limited edition watches in line with the various Bond movies. Special notes: The red material bag which contains the watch and scale tyres is normally missing when this watch comes up for sale. It is one of the rare components of this limited edition watch.